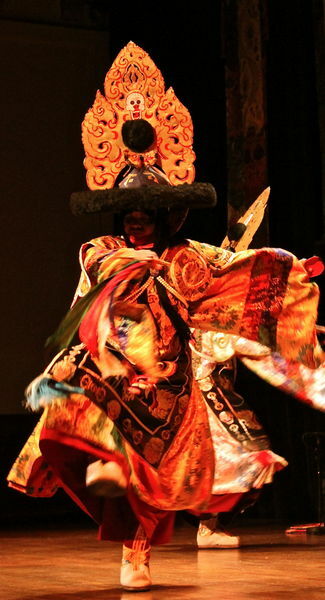 The Tashi Lhunpo Monks of Tibet will be presenting their unique performances of music, dance, chant and song at two significant events this month in Devon and Bristol. After that The Tashi Lhunpo Monks will have a two night residency at Arnos Vale in Bristol on Sunday 24th and Monday 25th June. Arnos Vale is, strangely enough, a Chapel and Cemetery (!) in Bedminster, Bristol described by the organiser Thomas Brooman (previously Artistic Director for Womad) as "a beautiful environment, a Gothic fantasy, with a tranquil and secluded atmosphere." The concerts begin at 7pm at Arnos Vale and the evenings will give the audiences a rare opportunity to experience the sacred music of Tibet in a sacred setting. Concert-goers can expect the chanting of Buddhist texts, the recitation of mantras, the ringing of bells, the clash of cymbals, the booming of the great long horns and the beating of drums. 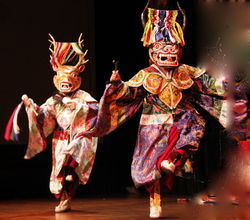 The Tibetan monks from Tashi Lhunpo Monastery offer a dramatic presentation of their unique sacred dances, music and prayers, with colourful traditional costumes and ceremonial masks. Tashi Lhunpo Monastery was founded by the first Dalai Lama in the 15th Century and became one of the most important monasteries in the Tibetan Buddhist tradition. Now re-established in exile in South India, the monastery is once again a major centre of learning, best known for its artistic tradition of masked dances and sacred music. 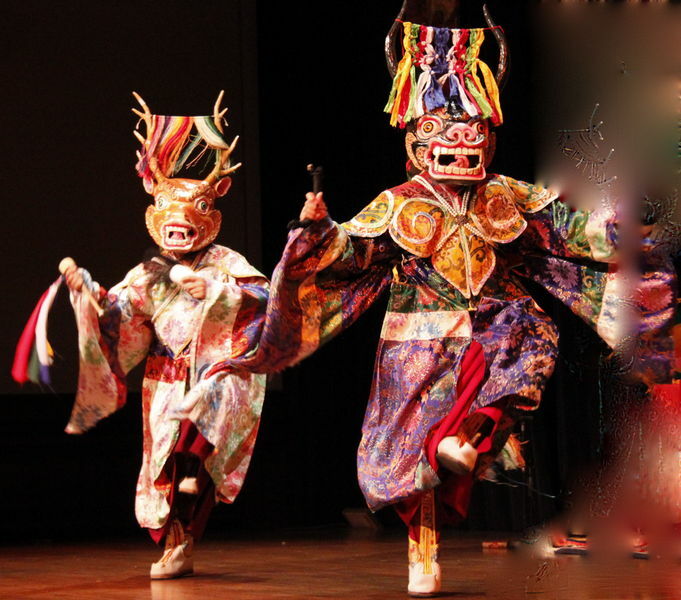 The performances by the Monks offer a rare opportunity to witness a unique and endangered culture. Please follow the Paypal link at the Arnos Vale web site to purchase tickets and they will be sent by first class post. Booking is recommended as seats cannot be guaranteed on the night. For telephone enquiries, please ring Arnos Vale on 0117 971 9117. To see photos from last year's Home Festival at Dartington (and the gardens themselves), click here (www.worldmusic.co.uk/galleries) and follow the links containing Home Festival or Dartington (about 11 galleries in all). Queen Victoria was new to the throne when Arnos Vale Cemetery opened in 1839 as a ‘garden cemetery’, inspired by the Père-Lachaise Cemetery in Paris and London's Kensal Green Cemetery. By then, Bristol's old parish graveyards were overcrowded, and Arnos Vale was established to provide a stylish yet spacious alternative, filled with sunlight, fresh air, trees and shrubs, and with its architecture and landscaping designed to echo classical Greece. For the next few decades, Arnos Vale had a near-monopoly on burials in Bristol. This is where you will find the graves of most of Bristol's leading Victorian citizens, industrialists, philanthropists, scientists and soldiers, as well as tens of thousands of others. Even when competing cemeteries, such as Greenbank, Avonview and Canford, opened later on, Arnos Vale remained busy, serving the huge and constantly growing working class suburbs of south Bristol. Arnos Vale has become the last resting place for more than 300,00 people.